Donna's Crafty Place: Congrats Grad!! I made this card for the CAS-ual Fridays challenge #4 this week. The challenge is to make a graduation item. I used my new letters to make this CAS graduation card. I really love using these letters, they're so cute and graphic. Thanks for stopping by!! That border punch is really great on this card! Great CAS Grad card :) Thanks for playing at CAS-ual Fridays! Nice work, love that border punch! Fun! Fun!! That notebook border punch is perfection for a graduation card! Thanks so much for playing with us at CAS-ual Fridays! Hope you'll join us again! Darling! I love that notebook border on the top and bottom and the letters are perfect. FUn! 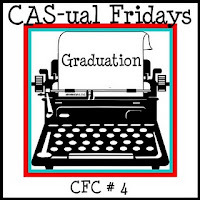 I'm so glad you joined us for CAS-ual Fridays. Sorry that I miss seeing this grad card! I love the color combo and crisp and clean design! Beautiful job!